I have a little bit of an obsession with Food Network. If there isn’t a show recorded on DVR that I want to watch, Food Network is my next go-to channel, followed by HGTV. Food and home improvement … you can clearly see where my passions lie. 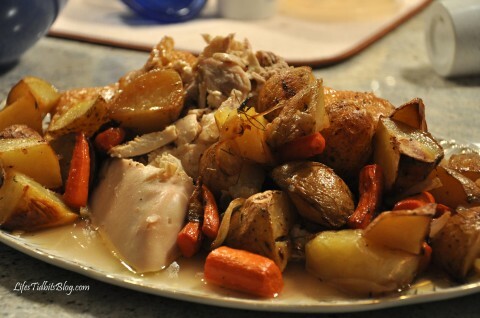 One day while blogging and watching Barefoot Contessa, Ina Garten was cooking her “Perfect Roast Chicken“. I quickly made a mental note that I must make this dish. An opportunity quickly presented itself and I adapted the recipe just a little. This dish is well … absolutely DELISH!!! Not only is this recipe super yummy, but totally falls within the healthy cooking/eating category. WIN WIN!!! And just to add one more log to this amazing fire (yeah I’m horrible with analogies, but I try!) it is also a pretty cheap dinner menu item that will impress!! So I hope you enjoy the Tasty Tuesday recipe this week. When you get the chicken home remove the chicken giblets and pat the outside dry, salt it inside and out, wrap it and keep it in the refrigerator for up to 2 days. Preheat the over to 425*. 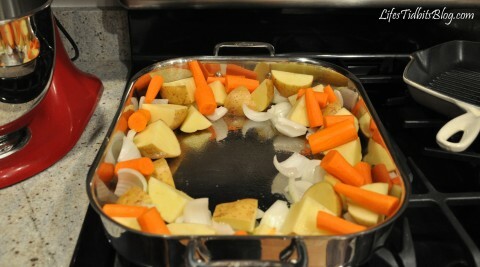 Place the onions, carrots, potatoes and some thyme in a roasting pan. Pat the chicken dry and liberally salt and pepper the inside of the chicken. 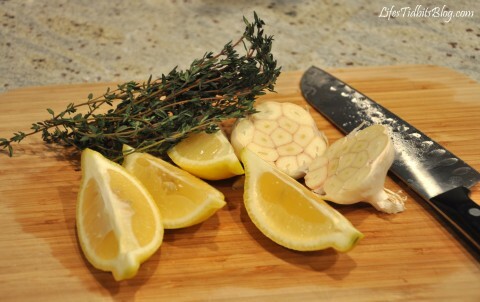 Stuff the cavity with the bunch of thyme, lemon, and all the garlic. Brush the outside of the chicken with the butter and sprinkle again with salt and pepper. Tie the legs together with kitchen string. 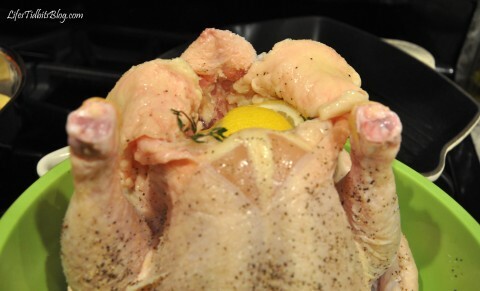 Place the chicken on top and tuck the wing tips under the body of the chicken. 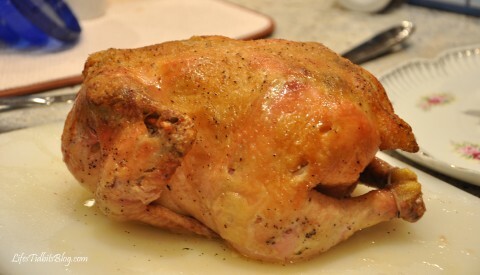 Roast the chicken for 1 1/2 hours, or until the juices run clear when you cut between a leg and thigh. Remove the chicken cover with aluminum foil for about 15 minutes. 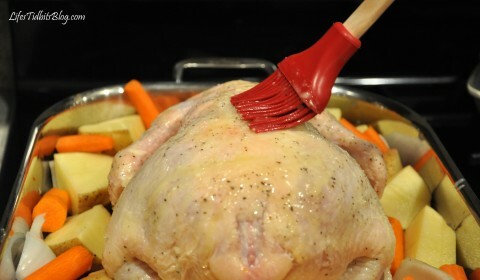 I suggest putting this in a bowl, because the juices will seep out of the chicken as it rests. I did this on a cutting board the first time and literally juice all over the floor and my dog, Sophi, was seriously pleased about this!!! Allow the vegetable to continue cooking. 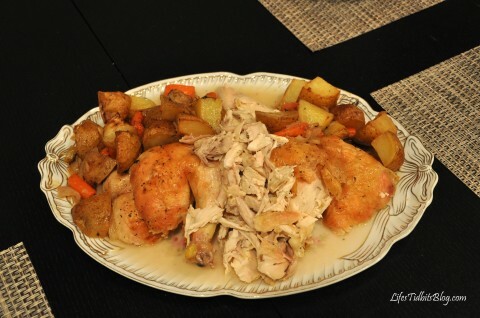 Slice the chicken and place it on a platter with the vegetables. I like to pour some of the juices over the chicken/veggies. The rest of the juice/gravy put in a gravy boat … I promise your guests will appreciate it! This serves about 4 people.